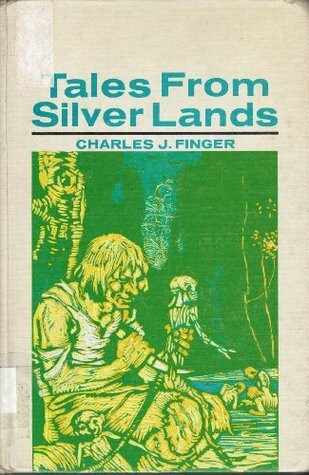 Tales from Silver Lands by Charles J. Finger is available at Amazon and AbeBooks. Don't forget to check at your local library! Nineteen folktales from Central and South America, including a "just-so story" describing how rabbits and rats got their tails. I read this 1925 Newbery Award winner as part of my mission to read all the Newbery Award and Honor Books. This book doesn't push racism or colonialism like some of its predecessors. Tales from Silver Lands is simply a collection of morality tales and, like all morality tales, the intent is to teach morals that transcend continental borders. I'm not well-read on South American folklore and I love folklore so this book should have intrigued me. The title of one story implies the writing style: A Tale of Three Tails. Here's a line from that story: "...there was a blackness like the blackness of night..."
I've read worse (The Dream Coach, a 1925 Newbery Honor book), but the writing leans toward purple prose and the collection feels more like an amalgamation of cultures, rather than a collection of South American lore. It seems like Finger was more interested in identifying exotic versions of stories that American/European kids could already relate to. For example, The Wonderful Mirror is a South American version of Cinderella, with Huathia as the leading male. Take that as you will. I do wonder how much of the stories were actually from South America versus how much came from Finger's imagination and literary influences?